This article is about the bird family. For other uses, see Starling (disambiguation). Starlings are small to medium-sized passerine birds in the family Sturnidae. The name "Sturnidae" comes from the Latin word for starling, sturnus. 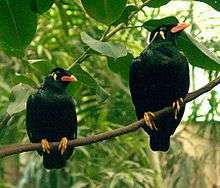 Many Asian species, particularly the larger ones, are called mynas, and many African species are known as glossy starlings because of their iridescent plumage. Starlings are native to Europe, Asia and Africa, as well as northern Australia and the islands of the tropical Pacific. Several European and Asian species have been introduced to these areas as well as North America, Hawaii and New Zealand, where they generally compete for habitats with native birds and are considered to be invasive species. The starling species familiar to most people in Europe and North America is the common starling, and throughout much of Asia and the Pacific, the common myna is indeed common. Starlings have strong feet, their flight is strong and direct, and they are very gregarious. Their preferred habitat is fairly open country, and they eat insects and fruit. Several species live around human habitation and are effectively omnivores. Many species search for prey such as grubs by "open-bill probing", that is, forcefully opening the bill after inserting it into a crevice, thus expanding the hole and exposing the prey; this behaviour is referred to by the German verb zirkeln (pronounced [ˈtsɪɐ̯kl̩n]). Starlings have diverse and complex vocalizations and have been known to embed sounds from their surroundings into their own calls, including car alarms and human speech patterns. The birds can recognize particular individuals by their calls and are currently the subject of research into the evolution of human language. Starlings are medium-sized passerines. 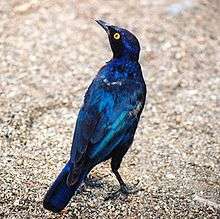 The shortest-bodied species is Kenrick's starling (Poeoptera kenricki), at 15 centimetres (6 in), but the lightest-weight species is Abbott's starling (Poeoptera femoralis), which is 34 grams (1.2 oz). The largest starling, going on standard measurements and perhaps weight, is the Nias hill myna (Gracula robusta). This species can measure up to 36 cm (14 in) and, in domestication they can weigh up to 400 g (14 oz). Rivalling the prior species in bulk if not dimensions, the mynas of the genus Mino are also large, especially the yellow-faced (M. dumontii) and long-tailed mynas (M. kreffti). The longest species in the family is the white-necked myna (Streptocitta albicollis), which can measure up to 50 cm (20 in), although around 60% in this magpie-like species is comprised by its very long tail. Starlings inhabit a wide range of habitats from the Arctic Circle to the Equator. In fact the only habitat they do not typically occupy is the driest sandy deserts. The family is naturally absent from the Americas and from large parts of Australia but is present over the majority of Europe, Africa and Asia. The genus Aplonis has also spread widely across the islands of the Pacific reaching Polynesia, Melanesia and Micronesia (in addition one species in the genus Mino has reached the Solomon Islands). It is also a species of this genus that is the only starling found in northern Australia. 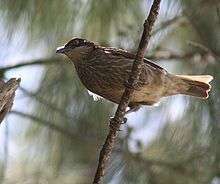 Asian species are most common in evergreen forests; 39 species found in Asia are predominantly forest birds as opposed to 24 found in more open or human modified environments. In contrast to this, African species are more likely to be found in open woodlands and savannah; 33 species are open area specialists compared to 13 true forest species. The high diversity of species found in Asia and Africa is not matched by Europe, which has one widespread (and very common) species and two more restricted species. The European starling is both highly widespread and extremely catholic in its habitat, occupying most types of open habitat. Like many other starling species it has also adapted readily to human-modified habitat, including farmland, orchards, plantations and urban areas. 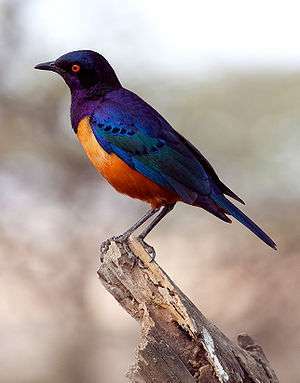 Some species of starling are migratory, either entirely, like the Shelley's starling, which breeds in Ethiopia and northern Somalia and migrates to Kenya and southern Somalia, or the white-shouldered starling, which is migratory in part of its range but is resident in others. The European starling was purposefully introduced to North America in 1890–1891 by the American Acclimatization Society, an organization dedicated to introducing European flora and fauna into North America for cultural and economic reasons. Eugene Schieffelin, chairman at the time, allegedly decided all birds mentioned by William Shakespeare should be in North America. The bird had been mentioned in Henry IV, Part 1, and a hundred of them were released from New York's Central Park. Starlings imitate a variety of avian species and have a repertoire of about 15–20 distinct imitations. They also imitate a few sounds other than those of wild birds. The calls of abundant species, calls that are simple in frequency structure and show little amplitude modulation, are preferentially imitated. There are local dialects of mimicked sounds. Starlings have also been known to imitate other man-made environmental sounds, such as phone boxes and cars. The diets of the starlings are usually dominated by fruits and insects. Many species are important dispersers of seeds in continents Asia and Africa, for example white sandalwood, Indian Banyan. In addition to trees they are also important dispersers of parasitic mistletoes. In South Africa, the red-winged starling is an important disperser of the introduced Acacia cyclops. Starlings have been observed feeding on fermenting over-ripe fruit, which led to the speculation that they might become intoxicated by the alcohol. Laboratory experiments on European starlings have found that they have disposal enzymes that allow them to break down alcohol very quickly. 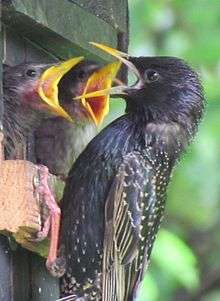 In addition to consuming fruits, many starlings will also consume nectar. 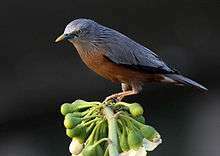 The extent to which starlings are important pollinators is unknown, but at least some are, such as the slender-billed starling of alpine East Africa, which pollinates giant lobelias. The starlings belong to the superfamily Muscicapoidea, together with thrushes, flycatchers and chats, as well as dippers which are quite distant and Mimidae (thrashers and mockingbirds). The latter are apparently the Sturnidae's closest living relatives, replace them in the Americas, and have a rather similar but more solitary lifestyle. They are morphologically quite similar too—a partly albinistic specimen of a mimid, mislabelled as to suggest an Old World origin, was for many decades believed to represent an extinct starling (see Rodrigues starling for details). The oxpeckers are sometimes placed here as a subfamily, but the weight of evidence has shifted towards granting them full family status as a more basal member of the Sturnidae-Mimidae group, derived from an early expansion into Africa. Usually the starlings are considered a family, as is done here. Sibley & Monroe included the mimids in the family and demoted the starlings to tribe rank, as Sturnini. This treatment was used by Zuccon et al. However, the grouping of Sibley & Monroe (besides leaving the subfamily rank vacant) is overly coarse due to methodological drawbacks of their DNA-DNA hybridization technique and most of their proposed revisions of taxonomic rank have not been accepted (see for example Ciconiiformes). The all-inclusive Sturnidae grouping is all but noninformative as regards biogeography, and obscures the evolutionary distinctness of the three lineages. Establishing a valid name for the clade consisting of Sibley/Monroe's "pan-Sturnidae" would nonetheless be desirable to contrast them with the other major lineages of Muscicapoidea. Starlings probably originated in the general area of the East Asia, perhaps towards the southwestern Pacific, as evidenced by the number of plesiomorphic lineages to occur there. Expansion into Africa appears to have occurred later, as most derived forms are found there. An alternative scenario would be African origin for the entire "sturnoid" group, with the oxpeckers representing an ancient relict and the mimids arriving in South America. This is contradicted by the North American distribution of the most basal Mimidae. As the fossil record is limited to quite Recent forms, the proposed Early Miocene (about 25–20 mya) divergence dates for the "sturnoids" lineages must be considered extremely tentative. Given the overall evidence for origin of most Passeri families in the first half of the Miocene, it appears to be not too far off the mark however. Recent studies identified two major clades of this family, corresponding to the generally drab, often striped, largish "atypical mynas" and other mainly Asian-Pacific lineages, and the often smaller, sometimes highly apomorphic taxa which are most common in Africa and the Palearctic, usually have metallic coloration, and in a number of species also bright carotinoid plumage colors on the underside. Inside this latter group, there is a clade consisting of species which, again, are usually not too brightly colored, and which consists of the "typical" myna-Sturnus assemblage. Interestingly, the Philippine creepers, a single genus of three species of treecreeper-like birds appear to be highly apomorphic members of the more initial radiation of the Sturnidae. While this may seem odd at first glance, their placement has always been contentious. In addition, biogeography virtually rules out a close relationship of Philippine creepers and treecreepers, as neither the latter nor their close relatives seem have ever reached the Wallacea, let alone the Philippines. Nonetheless, their inclusion in the Sturnidae is not entirely final and eventually they may remain a separate family. Genus sequence follows traditional treatments. This is apparently not entirely correct, with Scissirostrum closer to Aplonis than to Gracula for example, and Acridotheres among the most advanced genera. Too few taxa have already been studied as regards their relationships however, and thus a change in sequence has to wait. The review by Lovette & Rubenstein (2008) is the most recent work on the phylogeny of the group. The extinct Mascarene starlings are of uncertain relationships. Only one species is known from specimens taken while the bird was still extant; the other remains only known from subfossil bones and apparently one early traveller's description. The supposed "Leguat's starling" ("Necropsar leguati") was eventually determined to be a mislabeled albino specimen of the Martinique trembler (Cinclocerthia gutturalis), a mimid. As the avifauna of the Mascarenes is predominantly of Indian origin though as old as to be highly distinct, it is not clear to which clade these starlings belong—or even if they are indeed starlings, as the Réunion starling at least was highly aberrant and there have always been lingering doubts about whether they are correctly placed here. Birds of Hindustan: starlings, called pandāvalī. Illustration from a late 16th-century copy of the Baburnama. ↑ Zimmer, Carl (2 May 2006). 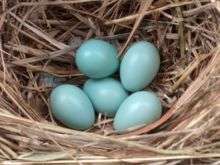 "Starlings' Listening Skills May Shed Light on Language Evolution". The New York Times. Accessed 14 January 2009. ↑ Doughty, Chris; Day, Nicholas; Andrew Plant (1999). Birds of The Solomons, Vanuatu & New Caledonia. London: Christopher Helm. ISBN 0-7136-4690-X. ↑ Mirsky, Steve (May 23, 2008). "Shakespeare to Blame for Introduction of European Starlings to U.S". Scientific American Magazine. Retrieved November 14, 2012. ↑ Prinzinger, R.; Hakimi G.A. (1996). "Alcohol resorption and alcohol degradation in the European Starling Sturnus vulgaris". Journal fur Ornithologie. 137 (3): 319–327. doi:10.1007/BF01651072. 1 2 Cibois, A.; Cracraft, J. (2004). "Assessing the passerine 'tapestry': phylogenetic relationships of the Muscicapoidea inferred from nuclear DNA sequences". Molecular Phylogenetics and Evolution. 32 (1): 264–273. doi:10.1016/j.ympev.2003.12.002. PMID 15186812. Lovette, I.J. ; Rubenstein, D.R. "A comprehensive molecular phylogeny of the starlings (Aves: Sturnidae)" (PDF). Molecular Phylogenetics and Evolution. doi:10.1016/j.ympev.2007.03.017. Wikimedia Commons has media related to Sturnidae.